Outline what services we offer along with the purchase of a stock boat design. 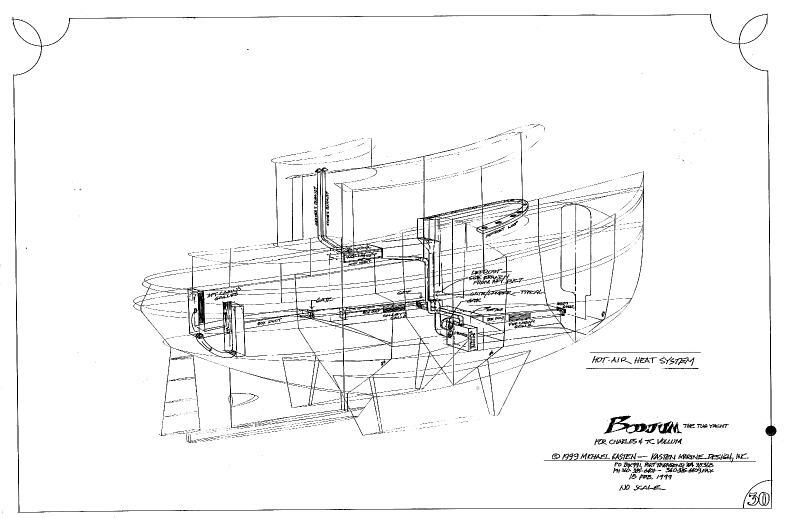 You can review the cost of our stock boat designs on our Plans List page. For our Completed Stock Plans, the prices given there approximately reflect the vessel size, the amount of detail within the plans set, what year (and therefore to what standard) the plans were developed, and whether there remains any work to be done in order to finalize or update the design. You will find a thorough description of what's included in a typical Stock Building Plans package on our Stock Design page. Our prices for Stock designs are likely to be approximately representative among designers, provided that the amount of detail being offered in the plans and design documents is about the same. No doubt some designers will offer Stock designs for considerably less, in which case I would be very cautious in terms of the amount of detail that's actually provided...! Among the designs on our Plans List page, you will find a number of designs that are as yet INCOMPLETE, the cost of which are considerably higher than the Completed Stock designs. Those INCOMPLETE designs have at the very least gone beyond the Stage I “concept” development, but for one reason or another were not pursued beyond discovering the layout and the hull form. Why bother offering INCOMPLETE designs...? Having already pre-determined the layout and hull form, the cost to complete those designs represents approximately a 20% discount versus the cost to develop a new custom design entirely from scratch. The reason for their cost advantage vs a new custom design is simply that those designs have completed the Stage I “discovery” phase of the design process, and are offered on the basis of completing them “as presented” without changes being made to their original hull form or layout. You will also find several designs offered that have been carried well beyond the Stage I "discovery" phase and those plans are discounted even further. Since those INCOMPLETE designs are offered at a substantial discount, they are a potentially attractive alternative to a full-on custom design. The cost of our INCOMPLETE designs amounts to our actual cost to complete the remainder of the design work to achieve a completed, buildable set of plans. Being more or less defined, but not yet detailed, a Prototype Design can be developed as is, or re-sized, or changed, or combined with another design, or can simply serve as a springboard / inspiration for creating an entirely new design. The cost to develop any of our Prototype Designs to completion will in nearly all cases amount to being the same as to start from scratch. The fact is, we are actually never starting completely from scratch...! Over the years I have developed hundreds of models and variations of models. Even if starting from a blank sheet with a new design, I will draw upon one or more pre-existing models to assemble the new concept. In addition to having a large inventory of models from which to choose, I have developed a fairly sizable collection of tools to assist with creating new designs - for example comprehensive spreadsheets to calculate structure, weight, performance, power, stability, and so forth, none of which need to be re-created from scratch with each new boat design. How Are Our Stock Designs Created...? For the best introduction to our stock boat plans, please review our "Sail Boats" and "Power Boats" pages. Most of the designs you'll find there are available as stock building plans. Complete information about ordering our plans can be found on our Plans List page. Each of our stock boat designs was originally developed as a new custom yacht design to suit a specific set of requirements, resulting in a unique design solution for a specific client. 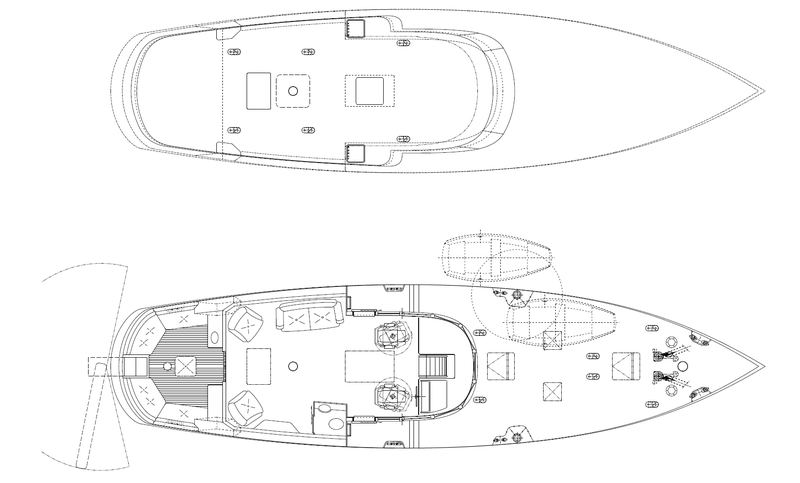 Our custom yacht designs are then subsequently offered as stock boatbuilding plans. If you find a stock design that will suit your requirements as-is or that may be suitable with a few simple modifications, that option offers a complete pre-existing vessel design at a very favorable cost. If a Stock Design only partially suits your requirements, we can make whatever adaptations are needed. If substantial revisions are being considered, it may turn out that a new Custom Design will be just as easily accomplished. After all, the cost of creating a new Custom Design is not all that large a percentage of the cost of a new vessel. In fact, it may come as a surprise that the cost to develop a new Custom Yacht Design is ordinarily less than the price of a yacht broker's fee charged for the simple formality of signing papers in order to purchase a new or pre-existing yacht. In the case of a new vessel built to our stock or custom building plans there is no broker commission involved, nor is there a commission of any kind whatever. In terms of the true cost of ownership, it is of considerable importance whether the vessel that gets built will suit the owner's needs, both now and in the future. If it does not, then the vessel's cost may turn out to be very high indeed. During the development of any new design it is our goal to assure that the resulting vessel meets the owner's requirements to the best possible degree. If the possibility of creating a new design might be of interest please see our web page on "Custom Design" for more information. Please have a look at our Prototype Sail Boat designs or our Prototype Motor Yacht designs where you might find inspiration for a new design. If one of our prototypes turns out to be suitable as-is, we can easily develop it into a completed yacht design. Or we can start from a "blank sheet" to create a new and unique design to your specifications. Estimating Plans: These consist of the Sail Plan or Exterior Profile Drawing, the Interior Profile and Arrangement Drawing, plus the Structural Profile & Arrangement Drawing, the Vessel Specification, and the Equipment List. For a complete look at any of our designs, or if you want to submit the design to a few builders for a construction estimate, the Estimating Plans set will provide the information needed by the builder for an accurate quote. 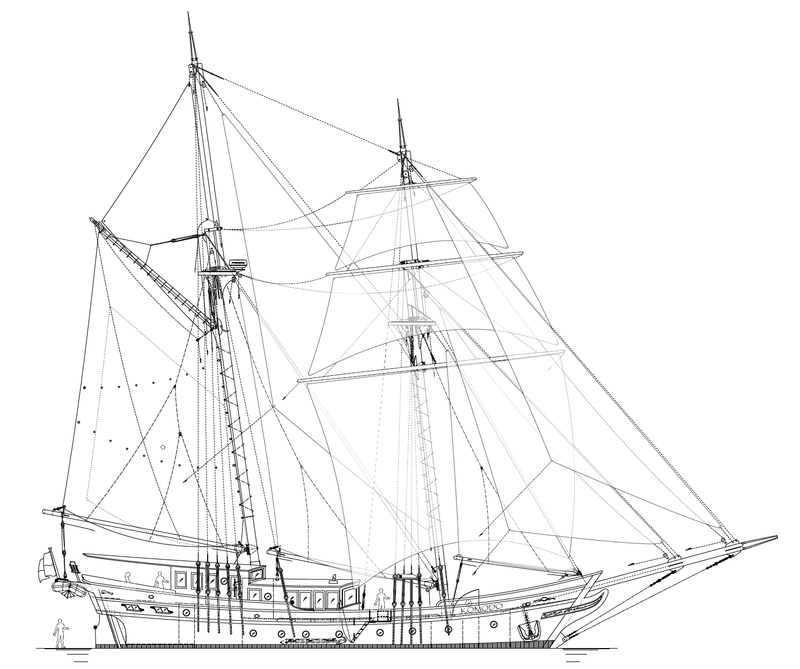 Building Plans: For actual construction of the vessel, all the design drawings and documents included with the Building Plans will be required. NC Cutting Files: For a number of our Stock Metal Boat Designs, we have developed computer defined cutting files, to allow automated pre-cutting of the metal structure. "NC" just means 'numerically controlled' cutting. NC Cutting Files allow a "boat kit" to be pre-cut by a computer driven plasma torch, or water jet, or router. NC Cutting Files are entirely optional, however they are an enormous aid to construction both for first time builders as well as professional builders. NC cutting provides vastly greater accuracy in the fit-up of parts and has the potential to save the builder quite a lot of labor during fabrication. These translate into a higher quality end product as well as an overall savings to the owner. Our Stock Plans prices are related to vessel size and to the quantity of detail originally developed for the design in question. You will find a complete price list of our available boat plans and NC Cutting Files, including plans ordering information on our Plans List Page. The Equipment List includes all the various mechanical and electrical equipment items. The Vessel Specification outlines the intent of the design, gives the vessel's proposed scantlings, construction materials for the hull and the interior joinery, the proposed paint schedule, and a preliminary indication of power, range, tankage, performance and stability. With the Estimating Plans, Vessel Specification and Equipment List in hand, one can then approach builders to inquire about construction costs. A complete list of our available Estimating Plans and Building Plans will be found on our Plans List page. While we will always help with builder recommendations, we do not provide builder lists or any builder contact information until an Estimating Plans set has been purchased, or in the case of a new design, developed. Builders will be unable to provide a firm quote until they are presented with Estimating Plans, including Layout and Structure Drawings plus a complete Vessel Specification and Equipment List. If a builder is not presented with a completed concept, they might offer an alternative design or a boat they have in production, which may be quite different from the design you may have envisioned, and which may ultimately prove to be unsatisfactory. Without complete plans and documents a builder's only other option is to provide an incomplete estimate or a wild guess - with eventual build costs likely to end up substantially different. The level of finish that is expected; etc. Without a good set of Estimating Plans, a builder will be in the unfortunate position of "attempting to apply a fudge factor to a variable based on an assumption about an unknown." In absolute terms they can only end up with. . . an unknown! Further, our builder recommendations will be made on the basis of the builder's suitability to the project being considered. Why is this 'suitability' consideration important. . . ? Some builders prefer to only build the metal hull / deck / cabin structures, while others prefer to build the whole boat. Some can build only up to a certain size of boat. Some do not want to fool with power boats, nor others with sail boats, some have a specific suitability to being able to provide the owner's expected level of finish, and so forth. Essentially, for each design and each owner there will be several qualified builders, and there will be others that are neither suited to the project nor possibly even interested. So, while we most definitely do make builder recommendations, we will only do so when we have also supplied the prospective boat owner with sufficient information in the form of actual Estimating Plans so that those builders can accurately determine construction costs . In this way an owner will not be wasting their own time. Just as importantly, an owner will not be wasting the builders time, nor ours...! What's Included With Building Plans...? A stock Building Plans Set will usually consist of the following drawings and documents. Larger vessels may have multiple sheets for any of the above, while smaller vessels may have some of the above combined into single sheets. In some cases, a design may have been more thoroughly detailed at the request of the original client, in which case the additional detail is likely to be reflected in the cost of the stock plans set. If you would like to know what drawings are included with a specific design, please let me know and I'll forward the drawing list for that design. If the original client has taken advantage of computerized pre-cutting for the design under consideration, then those NC Cutting files are made available for subsequent re-use by others. If NC cutting files have not yet been developed for any particular stock design, they can easily be created. Our detailed NC cut files include all internal structure and plating for the hull, deck, and cabins. Internal structure includes frames with cutouts for longitudinals, stem / keelson, engine beds, tank faces and lids, bulkheads, rudder components, keel foil components. All plating is defined, complete with marking lines for alignment and for cut out of the various openings. Much more information about our NC development process can be found on our Design Stream web page which outlines the process of creating NC Cutting Files, and our and NC Cutting web page which describes the potential savings and other advantages that NC cut parts make possible during construction. Before considering changes to any stock design, it is best to first obtain the Estimating Plans. Small changes to interior accommodations or 'style' from one owner to the next are to be expected, and are not usually any cause for re-design, re-evaluation or new drawings. Such changes can usually be addressed in a cover letter. Larger changes that involve the locations of tanks; engine; bulkheads or other structure, masts; sail area; engine power; or changes to any of the vessel's scantlings; hull shape; decks; or superstructures will require the expertise and approval of the designer of the vessel. Any of these latter changes can, and probably will, have an affect on one or more of the vessel's stability; the integrity of its structure; its safety; or its performance, therefore they must necessarily involve the designer of the vessel in order that all those elements be properly integrated into the final design. The cost of requested changes to any of our designs will be estimated in advance, and then charged for on an hourly basis. If one of our designs is appealing for your requirements, but needs a little something... we'll be pleased to provide our usual written Design Proposal for that work. Once in a while I am asked to provide a set of drawings for as little cost as possible, even to the point of requesting that I work out only a "faired set of lines." While that concept may at first seem appealing, it is a dangerous path to follow. In order for any vessel to be considered safe and suitable for construction, there are many other facets of the design that must be considered and integrated into the final result. In other words, the design process cannot be broken down into separate parts that can each stand alone. The design process is an integrated whole and it is very much a requirement to explore it thoroughly. Essentially, you do not want to have the guy with the cutting torch making design decisions independently of engaging the design process - even if the guy with the welding torch is yourself...! Suitability to the owner's requirements and to the intended service. An interior and on-deck layout per the owner's requirements. A pleasing aesthetic, longevity and ease of maintenance. Sensibility of structure for the sake of ease of construction. A functional layout for machinery and equipment. A distribution of weights that will provide correct trim and adequate stability. Performance suited to the vessel type. Structure according to the ABS, Lloyds, or GL scantling rules as is appropriate to the vessel's structure or build venue. For motor or sailing vessels under 24 meters measurement length, stability per the EU Recreational Craft Directive criteria for ocean service (ISO-12217). For motor or sailing vessels over 24 meters measurement length, stability per the IMO or MCA criteria for ocean service. From the above we can begin to see that when properly done, a completed yacht design involves no small amount work...! With luck, it will also be apparent that we cannot possibly extract or isolate one or more of the above ingredients and still hope to have a successful result. In many cases, a new Custom Design will be the most appropriate path to a new boat. While certainly there is cost involved in order to develop a new yacht design, we must consider the much greater cost that would be incurred if one were to build a half baked design that fails to meet one or more of the above criteria... It is for this reason that our design process has been developed in order to allow the greatest degree of flexibility so that the greatest degree of success with the vessel that gets built is assured. The cost to create a new design is ordinarily quite predictable. Prior to beginning any new design, we will provide a thorough estimate in the form of a written Design Proposal. If our proposal is acceptable and you elect to engage our services, the design work can begin. The best place to start the design process is to first create an owner's "mission statement." This can be as simple as a paragraph that describes the intended vessel, or possibly just a list of the features regarded as being important such as preferences for rig, power, equipment, materials of construction, overall size, accommodations, budget, project timing, and so forth. This 'mission statement' becomes our preliminary "Owner's Specification" which remains as our guidepost during the design process. This document need not be 'formal' in any way. It can be sent by fax, email or by letter. 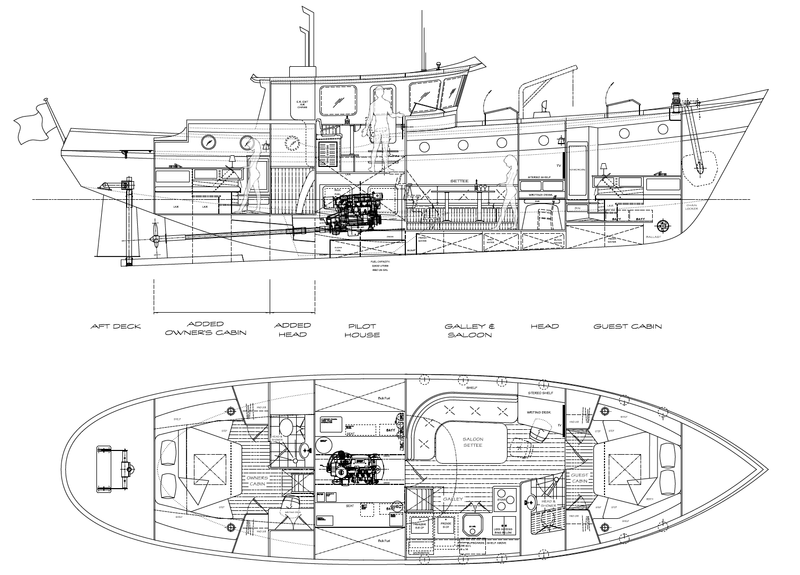 While owner provided sketches or design examples are not at all necessary, if you've developed preliminary sketches or have come across inspiring examples in your search for 'the right boat' they are often very helpful and if available should be included. After I've reviewed your 'Owner's Spec' and have understood your requirements, I will provide our usual written "Design Proposal" by return email. Our Design Proposal is offered free of charge, and implies no obligation whatever - it is just good information for your planning purposes. When you've reviewed our Design Proposal, if it seems as though a new yacht design may be the best option, then the process can begin. If you'd like to review an outline of the Custom Design process in greater detail, please review our web page on Custom Yacht Design. If you would like still more information, please feel free to contact me at your convenience. You may be surprised to discover that creating a new yacht design costs less than you think. It is by far the most rewarding path to long term boat ownership, and the process itself can be quite a lot of fun. For information on the cost of developing a new custom yacht design, please see our web article on Design Costs. For information on the potential cost of new construction, please see our web article on Boat Building Costs. Estimating Plans: These consist of the first few sheets of the actual Building Plans including the Sail Plan or Exterior Profile Drawing; the Interior Profile and Arrangement Drawing; the Structural Profile & Arrangement Drawings; our revisions to the Vessel Specification and Equipment List to suit your preferences; our recommended builder list; and letters of introduction to the builders. Building Plans: Includes all the design drawings and documents necessary for construction of the yacht. NC Cutting Files: A number of our Stock Designs in metal have been developed for computer cutting of the metal structure by using a computer driven plasma torch, router, or water jet. If NC files have not yet been developed for a given design, they can be created on request. In the case of plywood, a computer driven router can be used to pre-cut all the structural parts. In the case of fiberglass, NC cutting can be used to pre-cut the mould frames complete with stringers, as well as the mould sheathing. To order one or more of the above for any of our designs, please see our Plans List Page. New Stock Designs are being added at the rate of around two or three vessels per year, so if the current sampling does not provide just the right combination, please check in again! Or if you'd like to know more about creating a Custom Design to suit your specific requirements, you'll find a thorough description on our Custom Design Page. In any case, please feel free to inquire for more information on any of these options...!